" When I take on any assignment, my goal is to empower an organization to tell its stories with passion through media and public engagement. I work with an organization to ensure that its people tell their story credibly, authentically, and powerfully." Jackie Wright is the president of Wright Enterprises, a full service public relations firm serving the corporate, non-profit and government sectors nationally and internationally. A seasoned media and public relations professional, Wright has 20 years of media experience, including more than a decade of award-winning journalism experience in radio, television, print and Internet communications. She is a filmmaker and graduate of the University of Georgia's Henry W. Grady School of Journalism, home of the prestigious George Foster Peabody Awards. Prior to launching her own business, Wright served as Public Affairs Manager for KPIX/CW Bay Area TV, where she was responsible for public relations and community relations that included the creation and establishment of multicultural ethnic heritage month celebrations such as Asian Heritage Month, Black History Month and Latino Heritage Month; Wright created unique public service campaigns in which community leaders of different races would honor each other on air. Wright's media and community leadership initiated the establishment of the popular weekly national Jefferson Awards on KPIX. Her work also included the establishment of the award-winning Office of Public Engagement and Information for the San Francisco Unified School District as Executive Director; and leadership for the San Francisco County Office for the American Red Cross Bay Area Chapter as Executive Officer receiving the organization's highest management honor "The Tiffany Award for Excellence." During a time of high visibility and national media scrutiny for the San Francisco Unified School District, Wright developed the crisis communication plan and set up systems to handle the 9-11-2001 Crisis and the high volume of media calls over a five month period from local, national and international media about the controversial Edison Charter School. Wright successfully worked with staff to maintain a consistent message of the District's concern for the "well being of all students" as the charter school through deliberation by the local board of education transferred to the State. Aside from the media focus on controversy, Wright strategically improved the District's website to give an overall balanced look at the District's operations making it user-friendly for staff, parents and students. In addition, Wright developed the communication plan for the District's new academic plan "Excellence For All" which was rolled-out over a 30-day period with attendance at meetings of over 3,000 people resulting in written input from 2,500 participants. The written feedback was used to improve the plan that was filed in U.S. Federal Court and approved. The SFUSD communication plan was presented at a national association of education public relations directors in Minneapolis as an example of a successful education communication campaign. While at the American Red Cross, Wright was a member of the Executive Management Team of the Bay Area Chapter, serving as Executive Officer for San Francisco County. She worked her way through the ranks over a 10-year period from a Media Relations Associate to the Director of Special Events to ultimately, San Francisco County Executive Officer. In addition to her leadership as an Executive Officer responsible for budget development and management, program oversight, fund-raising, board development, government relations interfacing with city, state, and national politicians, and community relations, Wright served on the elite National Red Cross Headquarters' Rapid Response Team. As a member of the on demand team, Wright worked during major national disasters responding to national media and international news services with the requirement of being on a plane to head to a disaster within two hours of notice. Crisis Communications, media training, media and communication plans, community outreach, government relations, international business relations, social media, cause related marketing and fundraising provide the foundation of Wright's expertise. Organizations that have benefited from her skills include the CBS Television, United Way, San Francisco State University, SF Conservation Corps, the American Red Cross, the YMCA, WNGC Radio Station, WXAG Radio Station, KALW Radio Station, the Lorraine Hansberry Theatre, Alliance for Women in Media (Wright created San Francisco Chapter's the Belva Davis Diversity Scholarship) and Leadership San Francisco. Website: www.wrightnow.biz displays Wright's involvement with the community as a community trustee, a concept taught by the San Francisco Chamber of Commerce's Leadership San Francisco Program. Contact information: jackiewright@wrightnow.biz or 415 525 0410. San Francisco-San Francisco based Wright Enterprises was a delegate on the recent historic California Black Chamber of Commerce Trade Mission to South Africa during the inaugural Essence Durban Festival. The trade mission was the concept of Vee Govender & Associates of Durban, South Africa and Roland Washington of San Francisco. 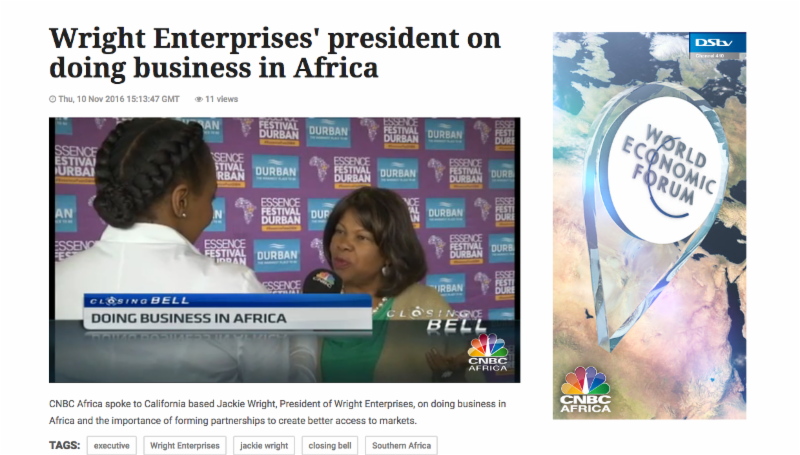 Jackie Wright, president of Wright Enterprises, spoke with CNBC Africa "Closing Bell" Host Gugulethu Cele after the panel she moderated: "Sustainable Economic Growth and Wealth Redistribution" at the Essence Festival Durban Business Conference in November 2016. Day one of the Essence Durban Festival, Wright spoke on that panel with Aubry Stone of Sacramento, President, California Black Chamber of Commerce & Board Member of the U.S. Black Chambers, Inc.;Ron Busby of Washington, D.C., originally from Oakland, President U.S. Black Chambers, Inc.; Ipeleng Mkhari, Founder & CEO Motseng Investment Holdings of Johannesburg, discussing "Sustainable Economic Growth and Wealth Redistribution" at the Essence Festival Durban Business Conference. More details of the historic trade mission to come in days ahead including philanthropic opportunities such as the fascinating Mazisi Museum & Foundation and the Malibongwe Service Center that touts a senior soccer team. As Andre Cantor would sing out...Goooaaalll!